Marlene C. Miller grew up Marlene Bailey in a little town on the edge of the Holmes County, Ohio Amish settlement. One day while ice-skating, Marlene meets Johnny Miller, an Amish boy five years her senior. She would later marry Johnny, join the Amish church at age 23, and have ten children. She remains Amish to this day. Overall impression: I liked the book. We’ve seen a few accounts of individuals leaving the Amish lately (see Ira Wagler or Saloma Miller Furlong). An account of joining the Amish by a person still in the faith is rarer. I asked an Amish convert once for an interview for this site, and was politely refused, a decision I could understand. At the same time Amish literary expression has flourished with more and more publications by Amish. Marlene is not afraid to share her warts in this book. If you enjoy raw first-person life stories you’ll like this one. God and Faith: Marlene is guided by her faith. She and her husband Johnny face their fair share of struggles. Their dream of Johnny farming full-time is cut short when he has to return to a lunchpail job to make ends meet. One of their children is killed in a tragic accident. A later business venture fails. Not to mention the dysfunctional home life Marlene emerges from. Marlene closes out Grace Leads Me Home with Psalm 150, and also a devotional account of the apostle Paul, a figure she finds particularly inspiring. She peppers her account with praise, thanks, and expressions of submission to God and His will. Pregnancy: You get the impression that out-of-wedlock pregnancies (or “being in a family way” as it’s referred to) are not as uncommon as we might think among Amish. Marlene’s family experiences them over three generations. In some cases the story ends with both sides Amish, others take a different outcome. So we remember Amish are human too. Health: Amish have a different attitude toward medical care. There are more than a few incidents in the book in which Johnny and Marlene’s children experience accidents and illness. These are cases in which the typical American would be flying in the car to the doctor’s or the ER within seconds. Amish are more inclined to take a wait-and-see approach, or to use traditional remedies, buttressed by heavy doses of prayer. The Millers are this way, though you understand that if Marlene had her way, there are times she’d have the kid in that car burning rubber to the hospital. Today Marlene promote nutritional products and writes about the experience with authentic zeal in one of the concluding chapters. “Feeling” Amish: Does Marlene really feel Amish? Living the majority of her adult life in the Amish community, she must to some degree. Yet she freely admits there are aspects of Amish life she’s never mastered. Like communication. She speaks English to the Amish in her community, who reply in English or Pennsylvania Dutch, which she can understand but has trouble speaking. She’s not too comfortable operating a buggy, and she feels awkward at times fulfilling the public duties of an Amish housewife. She sometimes betrays an outsider’s voice–sounding a little bit English as she occasionally drifts into praise of her community. At the same time her love of family, God, and farming seem authentically Amish. Maybe the obvious point is that you can never really “feel” Amish without being born into the culture. Grace Leads Me Home is full of moving moments–humorous, gut-wrenching, and inspiring. Marlene’s is a rare account of someone who joined the Amish and survived to write about it. She has her fair share of nicks and scratches, but a lot of contentment. Even though she goes through existential crises, heartbreak and pain at numerous points in her journey, you leave the book with a sense that she wouldn’t have had it any other way. Getting Grace Leads Me Home: It looks like there are only a couple of reasonably-priced used paperback versions on Amazon, though there is an Amazon Kindle version, which is what I got. According to their site, it can be also purchased in-store at the Gospel Book Store in Berlin, Ohio, and this Canadian bookstore which ships to the US also seems to be carrying it. I read the Kindle version of this book and recommend it. It was nice reading an overall positive account of someone joining the Amish as opposed to the usual negative accounts of some of those leaving the Amish. I also enjoyed this book as I grew-up in southwest Stark County an recognized the various location references. I am also partial to accounts set in places I know or have visited, especially the little nooks and crannies that don’t get much attention otherwise. I did order the Kindle version as I just don’t get around to reading print books any more. It’s so much more convenient in electronic form and easier to carry. I would have bought a lot more Amish related non-fiction if it had an electronic version. Does Eric’s book have an e-edition? My book does have a Kindle version Tom (below), and I am in your boat, many of the books I’ve been buying have been on the Kindle. I still like the old fashioned kind, but the portability is a big plus. I am not at all surprised by this comment since bed courting is so common in many of the Amish communities. This is a rare kind of book but a much needed one. I was Amish and left the Amish, not because I didn’t want to be Amish but because I was depending on my Amish-ness to save me and get me to heaven. In simple words God would not save me until I left because I was not looking to Him, nor to Jesus to save me. But was expecting the Amish church to save me. I just read an account of being Amish and couldn’t help but be dismayed at the belief that we have to stand before our God someday to see if we have done enough works to get to heaven. Titus 3:5 makes it clear that it isn’t by works.If I could work my way to heaven then Jesus death was not necessary. 1st John 5:13 tells me I can know I have eternal life.No guessing or waiting to see.He who hath the Son HATH LIFE.Not the guy that tries to work himself to Heaven. According to scripture the Amish are definitely mixed up. You can’t have faith without works, and works without faith. 2 and 2 go together. Do not let one little bit of info cause you to look down on people. I joined the lower Amish in Orange co Ind. Married the love of my life been married 35 years second oldest son is a minister. Well there were 2 used copies in the $7 range on Amazon an hour or so ago, looks like they are gone now 🙂 I don’t know why it’s not available new there–the used copies left now start at $150 each. This is a book I would love to get my hands on! Something positive in a negative world. Cannot afford that $150 price tag, so if any of you hear of someplace else I may purchase the book for $10 or less let me know. Also maybe someone would be willing to give up their copy? Katie, have read of your struggles and life and I admmire you! The phone call might go to a phone shack first before you get a reply. I paid $14.99 at her book signing in Berlin OH. Thanks Katie Troyer for the information on where I might get the book. I will call Marlene and leave a msg. It sounds as though this book is available, for all practical purposes, only as an ebook. I can’t help wondering how many Amish own Kindles or other ebook readers. The Kindle app is freely available for a wide variety of smart phones too, so one doesn’t have to be wired into the grid to use them. Does anyone know whether ebooks have made inroads into Amish communities? Damon I forgot to respond to this the other day. I’ve heard of a few Kindles here and there…an Amish friend got one but ended up returning it. I wouldn’t be surprised to see Amish getting these–especially compared to web-equipped cellphones (w/all the bells and whistles), the internet access on the Kindle is inter-neutered, with limited functionality (black and white, no video or ability to download). Plus it’s primary function is book-reading, which is what it excels at, net access, not so much. It does sound interesting. I might have to read this one. Thanks Erik for the info about the book. I just downloaded it to my Kindle. I look forward to reading it. Thanks for the brief synopsis. Folks interested in Marlene’s book may enjoy listening to a recorded interview that Suzanne Woods Fisher did with her last year on an Amish Wisdom “podcast” that is still available. Go to http://toginet.com/podcasts/amishwisdom/?s=amishwisdom, then scroll down until you come to “Wed. 5th of Oct. 2011: Amish Wisdom with Marlene Miller, member of Old Order Amish”. This Amish Wisdom podcast site , also, has very enjoyable and insightful interviews with Erik, Bill Coleman, Ira Wagler, Saloma Furlong, and others that you may want to check out! I can’t imagine why the price of $150 is shown on Amazon. That is ridiculous. Katie is correct that Marlene sells out of her home. My sister bought the book for me and sent directly to her home address. I believe she paid something like $15. The book is very well written and is so interesting. It brought tears to my eyes several times. Marlene actually mailed the book to my sister before her check had cleared so she is a very trusting person. I advise anyone interested in anything or anyone Amish to read this book. You will enjoy it. I don’t understand those wacky prices either, occasionally you do see them when a book is otherwise unavailable. If a book’s publisher doesn’t make copies available to Amazon to sell, other dealers may acquire copies and try to sell them at a ridiculous markup. I’m getting the book from the public library to read. It is currently checked out, but I’m the next one up! Thanks for telling us about this book, Erik! Margaret, I had the same idea as you. Headed for my public library this week to see if it was or can be purchased or checked out in our area. Happy reading to all. Thanks for the heads up, Erik. I love to read! The title alone is god enough to tempt me to read it. I am also curious about the feeling Amish part. I purchased the last reasonably priced copy immediately after reading about it this morning. I can’t wait to read it! I BOUGHT THE BOOK FROM MARLENE HERSELF. SHE MAILEED IT TO ME. IT IS WELL WORTH BUYING AND READING. Does it help you if I use your link? Some blog sites get a tiny contribution from Amazon if the purchase if made after clicking the link on the blog, instead of just typing in the Amazon address in a browser. Would it help you if we clicked the link on this page instead of ordering from our browsers or our Kindles? Author Marlene Miller is home again after being on a trip for more than a week. If anyone has been trying to contact her, they could try again. 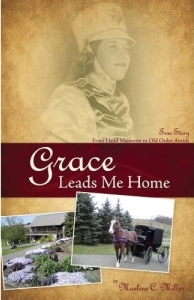 To let you know why my book Grace Leads Me Home is an Ebook. My very good non-amish friend who edited it suggested I do that. Because I lost money sending 6 books to amazon I discontiued that venture real quick. My book is 14.99+3.00 shipping & handling Ohio residents must pay tax. I self published and have done all the footwork myself. I’ve sold 6,000 books, 200 Ebooks, have done 23 book signings. Thanks to everyone for the unbelievable responses!! GOD IS SOOO GOOD!!! Marlene, very nice to hear from you on this post, and thanks for letting us know a bit more on the book and how it’s been doing. A big congratulations on that! My wife and I had the privelege of spending last week with Marlene and John on vacation. Her book is a great read as it tells of the trials and the joys of raising a large family in Holmes County Ohio. We, being from North Dakota, are so blessed to know them and many of their family members. What a great family. Give Marlene a call or send her a note and order a book from her. You will love taking to her. Marlene, your book is great, and I am just finishing off the chapter, “Growing Up Years.” It’s a book that I find impossible to put down, once I have started. You and Johnny have had a lot of good times in your life, and have endured some pretty hard times, as well, but with the Lord’s help and guidance, it is the only way to live. I purchased my book from ‘Gospel Book Store’ in Berlin, OH, and the girl there said that they have a lot of copies on hand. I just want to thank you for this interesting review of the book. I look forward to reading it soon. Thanks, again! Are there any Black Amish or have any Black (or Asian) people tried to join the Amish? My understanding is that there are a few, but that lack of historical and geographical proximity has limited what might otherwise have been a great alliance. Maybe one day someone will start a Black Amish community, though…. Along time ago My mother refused to wear the Kapp .Our family fell apart 7 children and 18 years later . So sad it was .I am 51 now + widowed Twice. I long to wear the kapp .